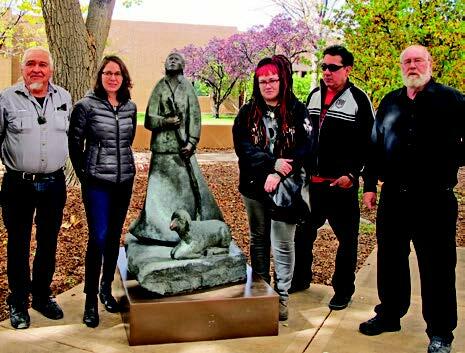 Two stunning sculptures by internationally recognized artists – the late Allan Houser and his son Bob Haozous – began gracing the campus this fall through the efforts of the Santa Fe Community College Foundation’s Art on Campus program. The two sculptures are on long-term loan through arrangements with the Allan Houser Foundation. Houser’s sculpture, Raindrops, gives an elegant touch to the campus courtyard, while inviting inspiration and reflection. 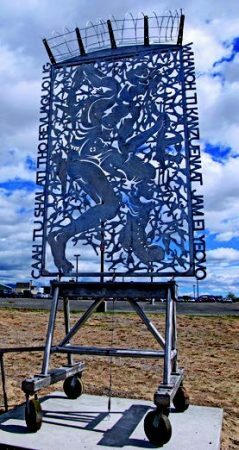 Houser (Chiricahua Apache) is one of the most renowned modernist sculptors of the 20th century. The artist sees the great value in public art as opposed to work shown only in a collector’s home. “Competition destroys creativity. Art is more than a vocation. It has to come from responsibility to the Earth and community we come from,” he said. the City of Santa Fe Veterans Advisory Board. 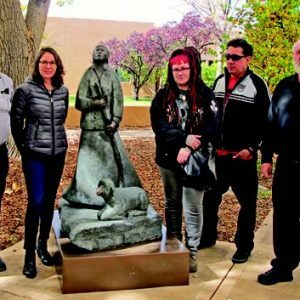 It is hoped that the fund, created with matching contributions from the city’s Veterans Advisory Board and the college’s Foundation, will help New Mexico’s veterans and their dependents complete a certificate or degree at SFCC. Santa Fe Community College was voted “Best for Vets: Career & Technical Colleges in 2016” for the second consecutive year. The college’s Veterans Resource Center provides comprehensive support services for students and is also open to the public. To apply for one of the scholarships, veterans should work with the SFCC Financial Aid Office. Students will need to meet certain eligibility requirements, such as enrolling in a minimum of six credit hours and maintaining at least a 2.5 grade-point-average. Interested students may follow up with either the Financial Aid Office or on-campus Veterans Resource Center.